The name enneagram comes from the Greek words “ennea” meaning nine and “gram” meaning written or drawn. 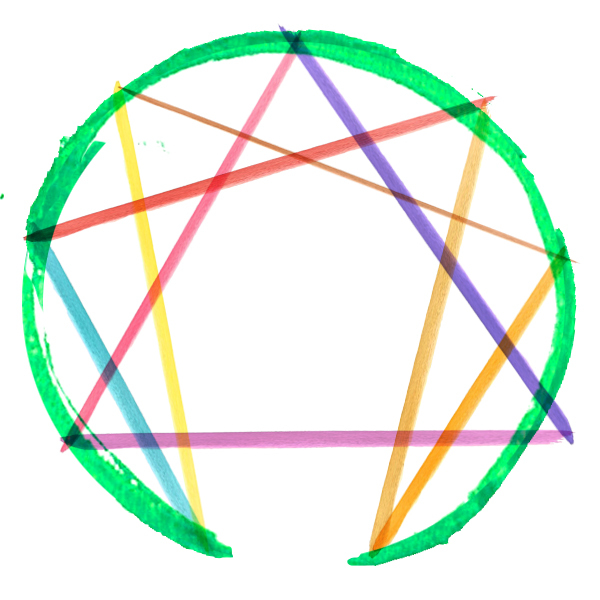 The symbolic representation of the enneagram consists of a circle with 9 points. The circle reminds us of how we are one body, sharing unity with each other even with all our differences. The 9 personality types are numbered 1-9. The numbers used for specific personality* types do not indicate any distinctive value or status. Since the Enneagram has come to the United States and works have been published, the numbers have been given a variety of descriptive terms. The diagram of the Enneagram represents the perpetual motion of our personalities. Each line drawn points us into a direction where our unique personality instinctively goes offering a significant shift in perspective or point of view, which allows us to step out of our typical reactions and create new ways to respond to the world around us. The energy or traits of other personalities offers balance and new resources to our core type. The circle, lines, and arrows depict how we are always in perpetual movement, never stagnant. This movement is necessary for us to follow our own path of spiritual and emotional growth. We limit ourselves when we allow our personalities to dictate or take control of how we respond and react to life. Some personality tools put us in a box and have us believe that “this is just who I am.” The Enneagram provides us with the opportunity to move out of our box of personality and more into our Essence and into who God has called us to be. The Enneagram is a Journey of self-exploration, growth, and transformation. What often gets in the way of change and transformation is our lack of consciousness about the unhealthy aspects of our personality. In being aware of our personality traits, we learn about the healthy and instinctive gifts we offer the world. We also learn about those unhealthy characteristics, (those we aren’t always aware of) that tend to get in the way of living a life that is authentic and full of potential. Change and transformation can only occur if we are aware of the changes we need to make. The Enneagram gives us the gift of purposeful awareness of our behaviors based on how we think, feel and do in the world and how we relate to others. The Enneagram enables us to discover which one of the 9 distinct personality types is the habitual lens through which we view the world; we recognize the healthy and unhealthy habitual traits of our personality. We learn to shed the unhealthy traits as much as possible, bringing out our gifts and revealing our true selves. We are not our personality; we are who we were at birth before our caregivers and society told us who we should be. We put on personality to get by, or in some cases survive, in our childhood. Our personality ends up covering up the Truth** of our Essence. We see the Truth of our Essence, sometimes for the first time, and we begin to experience who God intended us to be. The Enneagram is a life-long tool that enables us to develop ourselves over a lifespan as we and our life’s circumstances change. Personality is about our different ways of being human. Just as we all differ noticeably regarding our physical traits (height, weight, coloring, and so on), we also differ regarding our personality traits. Whether because of biology or because of life experience, different personalities will have different ‘instinctual ways of being in the world’ that vary from one individual to another. An individual personality instinct is typically a default reaction that is unconscious. Our way of being in the world is mostly habitual and predictable, beginning in childhood. Our personalities manifest in different styles of thinking, feeling and doing. A given person will tend to behave in certain ways that are broadly consistent over time but may be quite different from how a lot of other people behave.